And in conjunction with getting my new bed, the table that I had previously used as a beside table had to be put on the opposite of the bed. Which means the telephone wouldn't quite reach it and I needed something to put the telephone on. 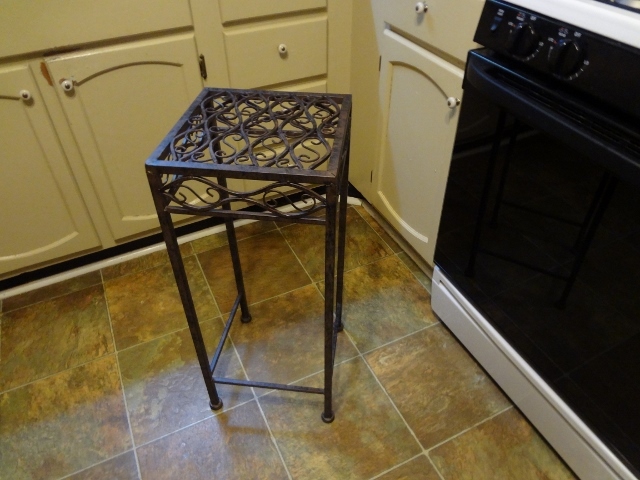 I just wanted something very small so began looking for a tiny table or stool or something that would work. I found a small square metal table at Hobby Lobby that would do (and it was on sale so that was a bonus) but I wasn't especially crazy about it - a little too fancy on top. 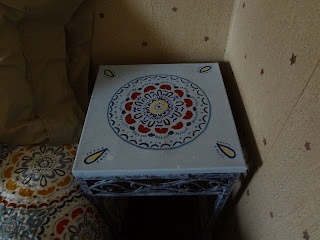 After searching for something to put on the top - a basket or picture or.....whatever...and not finding anything, I decided I'd just paint a canvas with something or other on it and attach it to the top. Now I do lots of crafting and lots of painting but not usually in conjunction with each other LOL So I first covered the canvas in a very light blue. 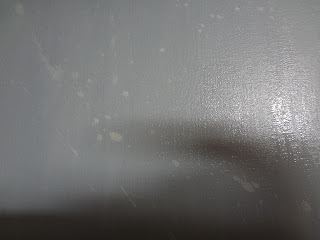 Of course, since my studio was cold, I did that work on my kitchen counter next to the sink LOL In the process of washing my hands I happened to drip a couple of drops of water onto the canvas while it was still wet. Taking my brush I just brushed over them which caused the paint to be mostly removed in those spots. Voila - I realized that if I did that all over the canvas, I could make it look a little time worn. Yea - one of those happy mistakes! Next I took a wet sea sponge and daubed the same blue all over the metal table. Simple to do and much better looking than the brown/black it had been originally. Once my canvas was dry, I took a dinner plate and drew around it, then free-handed the pattern on my bed quilt and painted it in similar colors. Once dry, I covered it with a coat of sealant. Shored up the bottom of the canvas with some wooden supports (so the phone wouldn't make it sag). And fastened it to the top of the metal table with mounting putty (so it could be removed later if I needed to re-do anything). 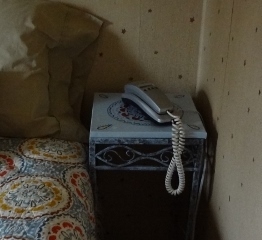 I'm really thrilled with the way it turned out - just the perfect size for the phone and small enough to fit between the bed and wall. One more project - DONE! Perfect. I have two tables like that with plants on them. Never like that fancy top just might use your idea. Have a great week. Gosh, Jill, this is just adorable. You are sooo smart..I never would have thought of making a new "top" for it....great idea. This is AMAZING!! I love that you matched it to your quilt pattern too. You are very clever, I love the repeated pattern from the quilt AND I love HOBBY lOBBY. Is that YOUR avenue of Spring trees in the post below, how enchanting! How brilliant is this! It looks stunning and adds so much beauty to the once plain table! It just warms up the space so much more than the metal! Good work lady!!! And I hope that you are having a wonderful weekend!